Contrary to every indication and all appearances, we are not one lonely musketeer trudging away down here. There are three other musketeers and they are all supposed to work together as one. The physical we know. The others we sense, either as an impetus for some worthy endeavor or as fleeting intusions upon our will. The other musketeers are known as the etheric, mental and emotional bodies. They envelope us, interpenetrating each other and the physical body. They have been variously described as sheaths like the skins of a baklava, or a layered sphere or four colanders whose holes aren't lined up but need to be for us to receive the full blessings of God. If they are out of alignment then the light descending from God can't move freely through us. By our free will, we block the light. 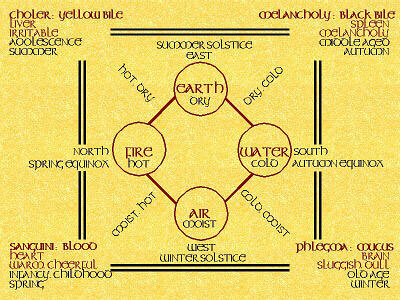 The etheric body is the largerst, then follows the mental, emotional and physical, or as depicted above, fire, air, water and earth. Many cultures and past ages divided up the seen and unseen world into those four categories, the Chinese added a fifth category by splitting earth into wood and metal. These concepts of energy, space and the physical universe correspond to our own little universe, you and me. I'm beginning to realize, more and more, that the key to true spiritual progress is the balancing of these four lower bodies. If even one is out of sync, then the ability of the light of God to reach us with the maximum light is impaired. We did not always move about compartmentalized. Before the fall of man, if we could look back, we would see men one with the great God Self above, lacking nothing, receiving the continuous flowing of light from God. Once we separated from the Divine intent the Tree of Life was not so readily accessible. The image and replica of God above us remained the same but the access to it began to shrink. Before there was a mighty trunk of light, a veritable torrent of light that descended from the upper most branches of the I AM Presence of God. But God had to restrict the evil that men do and so the trunk of light gradually thinned, until we resembled an orange tree, a beautiful round shaped upper portion filled with the fruits of all our good works and then the narrow taper of the tree reaching to the roots. The roots once reflected the glorious Presence of God above but the separation caused schism in our psyche. We created the four lower bodies out of that sphere of light. Jesus had healed his inner sight first or the third eye chakra and then touched him again giving him normal sight. The image of God is a sphere of Light, the Mighty God Presence above you. It's the tree of life your connection to Almighty God through that narrow crystal cord descending, through the Christ Self and then down to us here below. How much light we receive depends on how balanced our four lower bodies are and what we do with the energy God sends us. They aren't very balanced in most of us. Jesus knows this and wishes us to come up higher to receive his full blessing. We have to meet him half way. 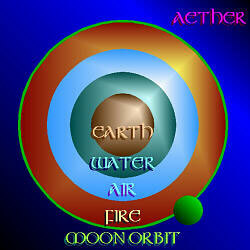 To do that it is necessary to blend, heal and transcend the four lower bodies, so that they become One. Since 1875, the Adepts and Masters came to help expound on the mysteries of God, things that Jesus taught in private to his disciples and other revelations that He said would be revealed at a later timeNow. I'd rather just quote straight from the source rather than paraphrasing. If you have a problem with adepts, messengers and Ascended Masters, I ask that you suspend your disbelief and see if you can detect the truth. At the risk of offending your ego, all of mankind need to purify the mental body to be able to accept the higher laws (that includes me too, I'm no walking, talking adept down here). "The mental body, at the east of the City, [each one corresponds to one of the four cardinal directions and you will notice that the Greek chart above differs and I believe is wrong, (their mental bodies weren't purified), that's a joke-Editor] was designed to be the chalice of the Mind of God through His Christ, providing man with perfect attunement with the very Hub of Life in the center of Cosmos and with the white fire core of every atom in manifestation. ..."
"When the mental (air) body of man becomes filled with the vanities of wordly wisdom, it is no longer resilient, no longer responsive to the delicate chords of the lost Word. 'Tis then that the logic of the serpent captivates his mind, and he lowers the cup of his consciouness ..."
"The emotional body corresponds to the south side of the City Foursquare as the reflector of the feelings of God and His Christ; of mercy and compassion; of faith and hope; of buoyant love, joyous determination, fiery zeal, and the appreciation of cosmic law, cosmic science, and the divine arts. It is also the repository of man's own feelings, his desires, and his emotions ( his energies-in-motion), which in many ways are more often turbulent than they are peaceful. ..."
"The physcial body, corresponding to the side of the west, provides the opportunity for man to express the summum bonum of his consciousness in Matter. As the higher etheric body contains the blueprint of individuality in higher planes, so on earth man sculpts the pattern of his identity upon the substance of his physical body. ..."
"When one allows his mind to dwell upon thoughts of hate, condemnation, lust, envy, jealousy, criticism, fear, doubt, or suspicion, and allows these feelings of irritation to generate within him, he will certainly have discord, failure, and disaster in his mind, body and world. As long as he persists in allowing his attention to be held by such thoughts--whether they be about nations, persons, places, conditions, or thingshe is absorbing those activities into the substance of his mind, his body, and his affairs. In fact he is compelling--forcing--them into his experience. "All these discordant activities reach the individual and his world, through his thought and feeling. Feeling often flashes, before one is aware of the thought in the outer consciousness, which he might use to control it, and this kind of experience should teach him how great is the energy within his many creations, which has accumulated through habit. "The feeling activity of Life is the most unguarded point of human consciousness. It is the accumulative energy be which thoughts are propelled into atomic substance, and thus thoughts become things. I tell you, the need of guarding the feeling cannot be emphasized too strongly, for control of the emotions plays the most important part of anything in Life, in maintaining balance of mind, health in the body, success and accomplishment in the affairs and world of the personal self of every individual. Thoughts can never become things, until they are clothed with feeling. "The Holy Ghost or Holy Spirit is the feeling side of LifeGodthe Activity of Divine Love or the Mother Expression of Deity. This is why the sin against the Holy Ghost is referred to, as that which brings great distress, because any discord in the feeling breaks the Law of Love, which is the Law of Balance, Harmony, and Perfection. "The greatest crime in the Universe against the Law of Love is humanity's almost ceaseless sending forth of every kind of irritable and destructive feeling. "One day the race will come to realize and recognize that the sinister, destructive forces manifesting on this earth and in its atmosphere--generated, mark you, by human thought and feelinghave only entered the affairs of individuals or nations, through lack of control in the emotions in everyone's daily personal experience. Even destructive thoughts cannot express themselves as action, events, or become physical things, except by passing through the world of feeling; for it is in this phase of manifestation that the activity of coalescing the physical atom upon thought forms takes place. ..."
There are many ways to control the feeling world. Its best to be aware of the energies before they even hit our feeling world. One way is through astrology. By being cognizant of major transits heading our way we can be ready for them and not react the wrong way with our mental body and then our emotional body. We can nip that karmic package right in the bud (ehteric plane) with mantras, prayers, decrees and\or meditations allowing the energy to flower instead turning to weeds. Now, to explain the activity of the atoms, we shall go back to our illustration of the electron and the atom which has been given you previously, (especially in the Autumn class of 1955). The Causal Body (represented by the circles of color around the upper figure in the Chart) may be likened unto an enlarged electron. Many of those electrons, swinging around a central core, form one atom. Between each electron there is a great distance (relatively speaking). As the electrons swing within their atom, they are either expanding their light or they are closed in by the discord and substance of the astral and psychic realm, which is like forcing pie-shaped wedges between these points of light. Now, when your thoughts, your feelings and your etheric memories dwell upon imperfection, you slow down the vibratory action of your electrons and then the substance of the psychic and astral realm closes in around them, lowering the entire vibration of your four lower bodies. In this way you become an easy prey to depression, poverty, ill-health, to any number of the various negative aspects which mankind at large mirror and out picture today. Now, in order to quicken the vibratory action of your inner bodies, you must use that Immortal Three-fold Flame within your heart and you must make conscious effort to accelerate the rate of the electrons as they move around the center of the atom. This is done through your decree work, through your songs, visualizations and applications, individually or in groups. It is done, also, by a constant vigilance over the type of feelings you allow to rest in your emotional world and the type of thoughts you dwell upon. This vigilance is necessary all through the daynot only during the hours while you are in classat which time you are directed primarily by someone in charge, whose endeavors keep your attention above the consciousness of the mass mind. The type of memories which you have and the type of physical environment, with which you surround yourself, also affects these inner vehicles. As you keep a vigilant watch over the activities of these inner bodies and you keep the vibratory action of each one of them up above vibrations of the psychic and astral realm, then there should be no difficulty in expanding the Christ Flame from within your heart. IF YOU ALLOW THESE BODIES TO DESCEND INTO THE REALMS WHERE DISCORD AND NEGATIVE CREATIONS ABIDE (THROUGH DISCORDANT THOUGHTS AND FEELINGS) THEN YOU HAVE AGE, DISEASE, LIMITATIONS AND DISTRESSES OF EVERY KIND AND DESCRIPTION. Your physical body is interpenetrated by your etheric body. These are enfolded by your mental body and your emotional body. All of these are made up of atoms, Those atoms are composed of a series of electrons in constant motion, spinning around its tiny centripetal heart. Now, the quality of the atoms of every one of your bodies is constantly subject to change, to purification and etherealization, or to becoming more gross and more heavy. That is why individuals are sometimes very beautiful when they are young (around eighteen years of age). Their faces then are clear and unlined, their bodies are alive and buoyant, but after they have passed through the discordant experiences of some twenty or thirty years, you find that the vital flesh atoms have been lowered in vibration. This makes the flesh form less beautiful than it was before the discord was registered upon it. Your emotional body is in a Constant state of motion, as is even this seemingly inanimate lectern upon which I place my hand. Science has confirmed that there is no such thing as inert or inanimate matter. Your emotional body is made up of millions of tiny electrons in constant movement, These form the atoms. Now, if that motion of the electrons is in accord with the rhythm of your God-Flame and is in accord with the constructive radiation of some Master, that is fine! Then your emotional body deflects all destructive feelings projected at you, as well as all the discordant energy which you contact. You are then the Master-control of all energy wherever you are! In other words, your feelings ride upon the surface of life, just as a cork floats upon the water and it requires no effort to sustain itself in that buoyant, happy state. However, if the vibrations of the emotional bodies are allowed to submerge that body beneath the buoyant poised happiness of the Master (uninterrupted harmony), the form of atom changes and you have a heavy and uncontrolled vehicle, which is part of the mass psychic and astral realm of mankind. In order to refine and purify such an emotional body, the student has to keep using the Violet Fire through it constantly! Here, let me digress for just a moment. Sometimes it is quite amazing to me to see what some people think about my feelings. My goodness! If I had been the lukewarm, sad-faced individual mankind picture me to be, I never would have gained the victory!. Beloved friends, divine love takes great strength! To honestly love in the face of betrayal, abuse and distress, takes great strength Love is not a negative, lukewarm consciousness which mankind so often accept in referring to the shepherd and the sheep. The shepherd is eternally vigilant and his love for his sheep takes him into many dangerous places, believe me! Dear hearts, we come to give you assistance in correcting that which is wrong in your world and to help you create strength of character. Every time you have a flare of discordant feeling, it blasts through your emotional body, setting all the electrons and atoms ajar. What happens then? After these little electrons and atoms get over their shock, they are vibrating in a broken rhythm and any of the psychic and astral realm around them, vibrating at the same rate, connect with them and become part of the substance of your own emotional vehicle. Meantime, through the natural proximity of the mental body to the emotional, the electrons of the mental body are also set into motion and you have another set of discordant vibrations. When the mental body is inharmonious, it tunes into other discordant thoughts and draws those types of atoms into itself, This stirs up etheric memoriessomebody did the same thing to you twenty years ago, and the etheric body starts into motion (audience laughed). Well, beloved ones, I am glad, you can laugh, but this is what happens to the average chela and student in a period of twenty-four hours, once if not more often. Then, all of these discordant bodies react upon the flesh and you have indigestion, a headache or some other physical distress. The flesh body will be prostrated for the time being. Then, all over again, you have to start to recreate a harmony among the members of your household. The beloved Maha Chohan brought out a good point of instruction, last night. You know, sometimes it is necessary for us to come together and discuss the class work, as well as your progress, individually. He said one of us should be sure to bring to the attention of the students the fact that repression of emotions is not the answer to this endeavor to sublimate the outer self. You see, repression of thoughts, emotions or actions will only cause frustration, which will react in either physical distress, or some mental or emotional block in consciousness. Transmutation of your energies is the safe way to get these vehicles into alignment. Now, you can use various methods of transmutation. If you are a very dynamic, powerful and positive individual and you have a great amount of energy to handle, you can transmute that energy in some type of constructive service. Those of you who are gifted musically, when you feel a surge of irritation approaching, still yourself for a moment and then do something good with that energy. Play the piano, write a kindly letter, do something you know will make someone else happy, do something constructive and make the energy in the emotional body render some good service, rather than allowing it to explode in the unbridled emotion of the moment. Please, dear hearts, do this with the mental body as well, if you have recurrent thoughts of self-pity or depression and if you continue to go back to thought patterns of impurity (some lifestreams have more to handle along this line than others), take charge of those thoughts right then and there! If your mind is inclined to dwell on the negative side of life, on either impurity, poverty or limitation of any kind, put your mind to work on something just the opposite. Give it a book to read, give it something constructive to do and re-channel that energy to where you want it to go! Give your mind constructive decrees to learn and repeat. As long as it wants to work, then give it one of the books of the Ascended Masters to read and let the energy work itself out harmoniously. The same thing is true of the etheric body. Individuals who have a lot of leisure on their hands, particularly those in mental institutions, old peoples' homes, prisons, etc. those who have not enough to do, allow the etheric body to continue to spin out records of past injuries, which have caused those conditions to manifest. The entire atmosphere in and around those places is permeated with that effluvia of depression. This is also true of students when they go on vacation or have too much free time. If the etheric body has not been fully purified, there will come out of this sub-conscious realm many things which cause you to feel a sense of being "hard-done-by", through the injustices of other parts of life. This is something to guard against. You can do the same with this etheric body as you did with the other bodies, either use your music or your reading, or render some constructive service to your fellow-man. This will keep your etheric body from that disintegrating practice of energizing past errors. If you will do this, beloved ones, eventually you will get the electrons and atoms of all your bodies polarized and harmonized long enough to let God, through you, fulfill himself. The Godhead must get all your vehicles to a point of uninterrupted harmony long enough to allow that beautiful Presence to fulfill itself in glory, through you, in dignity and in mastery. So it is! Not one electron or atom escapes from experiencing the results of the vibrations sent out by, the individual. The Law of the Circle is absolute and ALL must return to its source one dayeither for purification or reward. That which is GOOD is deposited in the Causal Body and that which is discordant (because of its very density and low rate of vibration) stays around the physical body and its environment. It is this accumulation of evil which forms the astral or psychic plane! This discordant accumulation (individual as well as the collective discord in the astral and psychic realm) must all be purified and redeemed one day, before the ascension can take place. This purification is accomplished through the constant, dynamic use of the Violet Transmuting Flame. When 51 % of the energy of ones lifestream has been drawn into the Causal Body, qualified with perfection, then that individual's ascension into his Presence (his source of God's Perfection) has begun. From: The Bridge to Freedom Journal Book 2, pp. 491-496, see link below. "The violet flame is more than violet light. It is an invisible energy that appears violet to those who have developed their spiritual vision. In previous centuries, knowledge of the violet flame was given only to a chosen few who had proven tnemselves worthy. 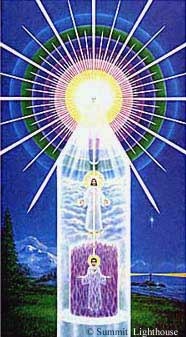 Saints and adepts of East and West have long used the violet flame to accelerate their spiritual development, but this oncesecret knowledge was not revealed to the masses until the twentieth century. Djwal Kul in the Human Aura book gives an amazing meditation on balancing the four lower bodies by increasing the 'sacred fire breath' in all of the chakras. I've included it on the meditation page as well, Djwal Kul's Sacred Fire Breath. The worldly vibrations always seek to tear the Christ down and to throw us off the path. Sometimes we allow this to happen by a momentary let down of our aura. Various habits can weaken the four lower bodies. Lack of exercise and sugar weakens the physical, restricting the ability of the body to hold and retain light. Alcohol and discordant music will adversely affect the emotional. Cigarettes and filling the head with wrong concepts from certain books and TV will steer the mental body in the wrong direction and make it flabby. Drugs attack the etheric, even the overproscribed use of ritalin and prozac. To feel the presence of God and the light He sends us, one must be on guard, just like the musketeers, ever vigilant, striving to get those four lower bodies to work together as one. When they are, the all of God will be for the one who stands for God. "...you raise your emotional bodies into a more rapid pulsation. The electrons move about more rapidly around their central core in the atom and your emotional body is then magnetizing only that which is good. As soon as you allow your feelings (emotions) to tie into disapproval, fear, anger or discord of any kind (and the name therof is"legion"), you slow down the vibrations of those feelings and lower them into the strata where those mass feelings of imperfections abide. When you endeavor to satisfy the appetites of the four lower bodies by taking into the physical form intoxicating liquors, flesh foods, chemical combinations which do not agree with your particular well-being, or taking into the body more substance than it needs to keep it in a healthy condition, fermentation, general disintegration and, finally, "death" ensues. As the electrons move more slowly in their orbit around the central core of the atom, you thus open your flesh bodies to disease. It is just the mechanics of living. The holding of your attention one-pointedly upon the ever-presence of God, together with the assistance of this oval of blazing light which I have established about you today, will enable you to keep your four lower bodies vibrating above the discord in which you move. Then, truly, it can be said that there is nothing in you to which evil and discord can tie!" To help raise that attention above, I leave you with one final analogy and uplifting meditation on the four lower bodies from Lanello click here.